This holiday season the Foundry is hosting two simultaneous mapmaking competitions. Each competition will have a distinctly different focus, and each will be open to a different segment of the ConquerClub mapmaking community. The prize for winning either competition will be one year of premium membership, to be awarded by lack when the map becomes a fully playable CC map. Read on! Given all of the thoughtful feedback we see here in the Foundry, we know that there are many talented artists out there who have yet to complete a map of their own for one reason or another. So this holiday season we wish to give thanks to these 'amateur' CC mapmakers by setting up a tournament that is open only to those CC members who have neither seen a map of theirs Quenched, nor who have one currently in the Forge awaiting Quenching. If that describes you, then this is your chance to get your name on a ConquerClub Map. 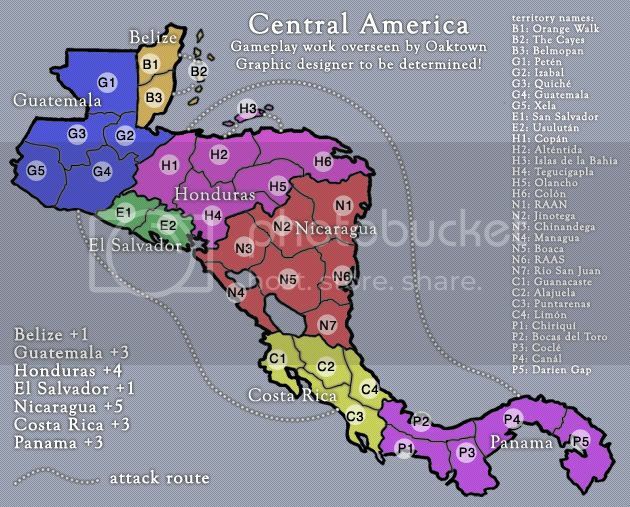 The subject of this competition will be the Central America map (see second post). The basic gameplay and territory layout have already been fleshed out by the Foundry, and oaktown has volunteered to see the map through the Gameplay stamp process and to deal with XML and army coordinates. Your task will be to lend your artistic talents and vision to this map. It is the mapmaker's responsibility to understand and comply with all Foundry standards, including those regarding image size, use of copyright-free images, leaving required space for army counts, etc. See the How to Make a Map Handbook for specific expectations. Host your map file (one entry per contestant please) using Photobucket or some other file sharing program, and provide a link to Oaktown by 11:59pm GMT on December 10, 2008. In order to maintain anonymity during the competition, please do not post your own maps. A one-week voting period will be held to determine finalists. Finalists will then have an additional period of at least two weeks to make changes to their image before submitting a second link by a date to be determined... we don't want the voting to fall during the holidays so we'll give ample time before starting round two. Once a winner is chosen, the map will go through the standard Foundry process required to receive a Graphics stamp; we reserve the right to require gameplay/territory name changes should such concerns come up as a result of continued gameplay discussion on this map. What you can NOT change about the map: connections between regions/territories, bonuses, and territory/region names (though you can certainly lobby for such changes if your map wins). What you CAN change about the map: everything else! Color choice, type, the legend and title, textures, map perspective - basically any and all graphic elements of this map. The look and feel of this map is entirely yours to create - give it some flavor! Because we couldn't entirely exclude our talented crew of experienced mapmakers from all of the fun, the Foundry regulars have their own competition. Lack has given us the nod to go ahead and revamp the much-maligned Centerscape map, which replaced an old CC favorite which ran into some legal difficulties. The basic gameplay must remain the same your primary task will be to develop a new, copyright-proof theme and design for this map. It is the mapmaker's responsibility to understand and comply with Foundry standards regarding image size, use of copyright-free images, leaving required space for army counts, etc. Maps not meeting Foundry standards and/or raising any copyright concerns may be withheld/removed from the competition. Host your map file (one entry per contestant please) using Photobucket or some other file sharing program, and a link must be provided to gimil by 11:59pm GMT on December 10, 2008. In order to maintain anonymity during the competition, please do not post your own maps. Once a winner is chosen, the map will go through the standard Foundry process required to receive a Graphics stamp. And while the XML is already in place the winning mapmaker will be responsible for updating the territory coordinates to fit the new image (the winner can farm this work out). This competition is open only to those mapmakers who have already quenched a map, or who have a map in the Forge currently awaiting a quenching. This is more than a revamp; it's a complete restart! Connections between regions/territories and bonuses must remain the same, but everything artistic/thematic is up to you! Alright everybody - your first draft is due in three weeks, so get to work! Last edited by MrBenn on Mon Jan 12, 2009 6:19 pm, edited 2 times in total. The challenge will be to come up with a stunning and original look for this map, currently undergoing a gameplay review in the Foundry (clicky). In developing an approach to this map, you are encouraged to consider the history, culture, and geography of the region. There are no restrictions as to time period or theme - this is your baby, so bring your own unique vision to the map and give it some flavor! 7 bonus zones (the Central American countries). Sea routes connect territories as noted. The current configuration of names is for identification purposes only - territory names should appear on the territories. The challenge of this competition will be to put a new face on the Centerscape (formerly, well, you know). The sky's the limit, but make it copyright-proof! Classic gameplay, with a one-way attack. Army count coordinates can change, but connectivity cannot! oaktown wrote: This competition is open only to those mapmakers who have already quenched a map, or who have a map in the Forge currently awaiting a quenching. does it count if you were one of the 2 people working on xml for a map that got to the final forge but got taken back to the drafting room then abandoned then brought back then vacationed? You're welcome to attempt the Central America one? Good luck all - maybe this will breath some life back into this group! Nice clear write-up Oak. Rules look pretty solid. The original scheme was to just do the amateur competition, and it was ready to go when the Centerscape redux was approved... given that folks don't want to wait for Centerscape, this seemed like an interesting solution. Everybody is included in one competition or the other - it just levels the playing field a bit in each. I'm a little disappointed not being able to compete in Centrescape But I suppose I can give Central America a go. If you get Antartica into the forge you could? I'll throw somethign together for centerscape. Hell yeah! My GIMP-port-for-mac skills aren't nearly enough to make a map (perhaps if I had access to CS3... meh oh well), but I'm stoked to watch the competition take place. Good luck to the competitors, and may the best map win! So where and when do we post what we come up with? e_i_pi wrote: So where and when do we post what we come up with? read rule #2, above... to maintain annonymity you don't actually post anything, you just send a link to your file to either me or andy (depending on which competition) and we will post the files annonymously, hosting the files using a neutral account. I doubt it's a problem - the fact that he's had to repeat it renforces it for the reader. yeti_c wrote: I doubt it's a problem - the fact that he's had to repeat it renforces it for the reader. Indeed - as people ask questions it points out what areas I need to go back and clarify. I've already added a note about whether or not a quenched XML writer is a amateur or not. Is there a preference on whether we submit a large or small version? 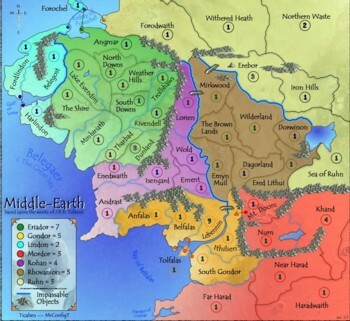 could you show us the "middle earth" map? It'd make this a ton easier for me. attacking lines are really annoying for me to convert back into regular territories. wcaclimbing wrote: could you show us the "middle earth" map? The links in the Map Development thread no longer work... the only thing I can suggest is to ask a couple of people who put videos together for the 100 maps celebration to see if any of them have a copy saved somewhere? I think the idea was that without really a background or anything, you could form the image around the current centrescape map. bryguy wrote: I think the idea was that without really a background or anything, you could form the image around the current centrescape map. my problem was more with translating the attack lines into territory borders. borders are much easier for me to work with. Hey Oaktown, you wanna post the PSD?